Thankfully, lives and homes here generally fared well through the storm; what of the plants? As I write (August 31st), persimmon, chestnut, black walnut, and filbert trees that I planted are still ankle deep in standing water. Farm fields a mile down the road also are still inundated or, at least, have soggy soil. The combination of heavy rains and winds loosened the grip of tree roots onto the soil. Some trees blew over. Some are wobbly in the soil. It may be possible to right and stake the former, and just stake the latter, if the trees are not too big. After a year or more, new roots will grow to provide sufficient support without the stakes. The other problem with wet soil is that the water displaces air. Roots need to breathe. Without air, roots don’t function. They then can’t even take up water so may show the same symptoms — leaves dying and drying up beginning at their edges — as do plants suffering from drought. Fruits also may drop prematurely and various nutrient deficiencies may show up in the form off color leaves. So the faster the water table recedes down into the soil the better. I’ll be watching and waiting; not much else anyone can do. 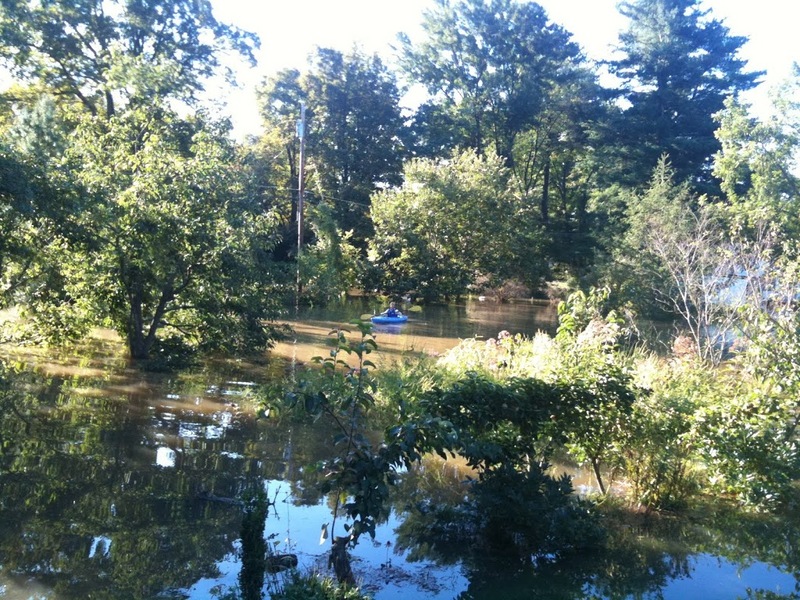 The weird thing about hurricane Irene is the clear sunny days that have followed. Look out any rear window in my house at ground that wasn’t flooded, and it’s business as usual. The plants there got a good soaking and and then had bright, sunny days. What else could a plant ask for? 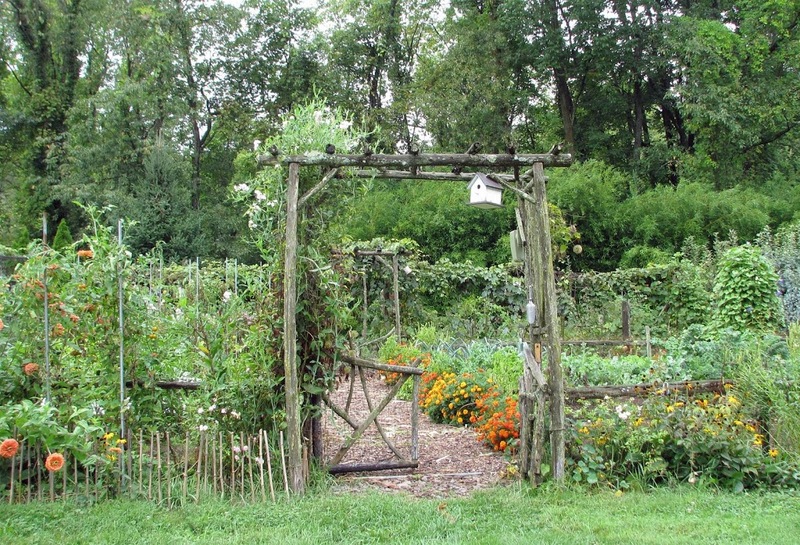 The bed with the last planting of corn needs to be harvested and cleared, as does a bed of bush green beans and edamame. Once cleared, these beds will snuggle in beneath a one-inch blanket of compost (yearly additions of which have contributed to the soil’s excellent drainage). They are then ready to be seeded for late crops of spinach, radishes, and lettuce, planted with waiting transplants of baby bok choy and lettuce, or planted to a soil-improving and protecting cover crop of oats and peas. My vegetables were not exposed to flooding; not so in other vegetable plots. If the flooding was only from rainfall on-site, the only thing to do is to watch and wait for the water to recede and roots to take a deep breath. Flooding from overflow of streams and rivers poses other problems. Think of all the detritus carried along by that floodwater. And then try to imagine some of the stuff you didn’t think of. The major problems I see are floating gasoline and diesel cans and the major problem I smell is of the stuff in those cans. What I don’t see or smell is whatever is running off farm fields and the overflow from sewage treatment plants, not to mention harmful chemicals and bacteria. Any of these substances could contaminate flooded vegetables, especially vegetables that were ready to be harvested, by lodging onto leaves and fruits and working their way into pores. Root vegetables would be least contaminated. Hardest to clean and most subject to contamination would be leafy vegetables. Easiest to clean would be vegetables with hard skins, such as winter squashes. A warm solution of Chlorox in water used as a wash or a soak should kill surface bacteria of those vegetables that can tolerate such treatment. Lee – I enjoy your posts each week. Seems like you have changed the font size recently; this older folk is having difficulty reading the posts now. I agree. For some reason (and other Google bloggers have also had this problem), I can’t make the font look different. I’ve tried just about everything. I’ll keep working on it. Please don’t stop reading!